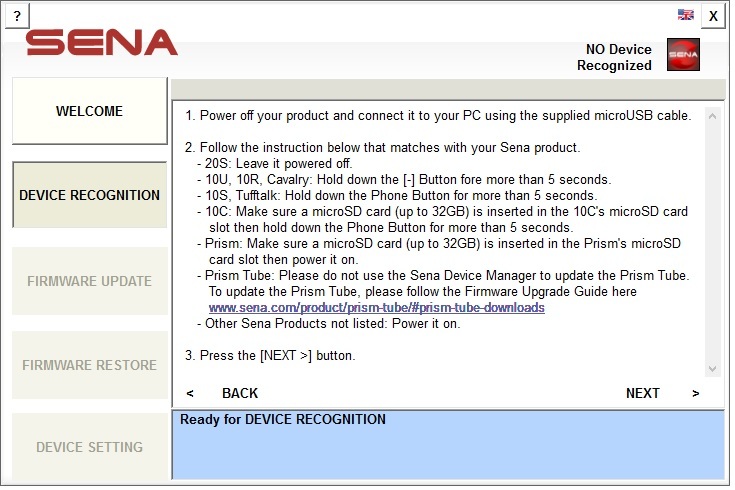 The [Device recognition] page displays instructions on how get Sena Bluetooth devices recognized by Sena Bluetooth Device Manager. The manager confirms that the device connected to the PC is same as the sena device by recognizing here. This [Device recognition] procedure keeps users from mistaking a device for another. It can also prevent the selected device being updated with the firmware of a different device. It opens by pressing the [NEXT >] button at the [Welcome] page. It also opens by pressing the [DEVICE RECOGNITION] button among the work list buttons. : displays the instructions on how get Sena Bluetooth devices recognized by Sena Bluetooth Device Manager. : moves to the [Welcome] page. Moving to the [Firmware update] page if device recognition is a success. NOTE : After activating device at step 1, turn it off and turn it on again to recognize at step 2.